Global warming is changing our planet in horrifying and potentially irreversible ways, and a nature photographer just captured its terrible impact in one incredible, heartbreaking image: This photo of a baboon eating the bugs out of Regis Philbin’s hair on a tiny chunk of melting ice shows the utter devastation of climate change. Just awful. A picture like this says so much more than charts or graphs ever could. 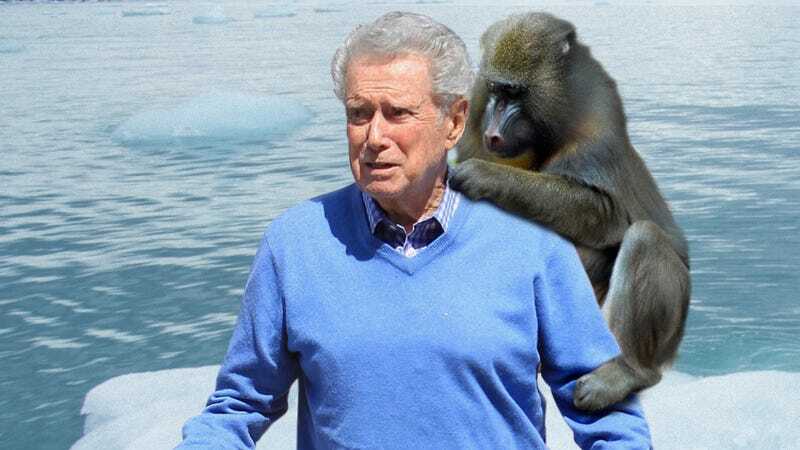 When Norwegian photographer Sven Andersen spotted a baboon meticulously grooming beloved television personality Regis Philbin on a piece of sea ice no bigger than a twin bed, he knew he was about to take one of the defining photos of anthropogenic climate change. Where, decades ago, the baboon and Regis Philbin would have frolicked over vast, towering glaciers, now they must huddle on a tiny fragment of ice barely large enough to accommodate their bodies, helplessly watching as forces beyond their control carelessly erode what little habitat they have left. Looking at the baboon’s eyes as he carefully picks bugs out of the former Who Wants To Be A Millionaire host’s scalp, one almost senses a glimmer of deep sadness, as if he somehow knows that rising greenhouse gas levels all but guarantee that he and his friend Regis Philbin will not survive more than a few years. Our cars, our air conditioners, our lifestyles of convenience and comfort—were they really worth it if this is the cost? If humanity doesn’t make serious changes to the way we treat our Earth, the majestic Arctic baboons that spend their days scouring Regis Philbin’s graying locks for insects could end up lost forever, and photos like this will become haunting reminders of the world as it once was. Even if we manage to change our course from the calamitous environmental upheaval we’re heading towards, it might still be too late for the noble pair of friends captured in this photograph, who may have already met a tragic fate in the waters of the Arctic Ocean as the last fragments of their home melted away. The incredible mutualistic relationship that has evolved between the Arctic’s baboons and the television host whose hair provides them with a steady diet of ticks is one of the true marvels of the natural world, and if we can’t bring ourselves to give up fossil fuels within the next decade, future generations will never have the chance to see these wonderful creatures for themselves. Absolutely heartbreaking. Here’s hoping it’s not too late for the beautiful creatures immortalized in this devastating photograph, because the world will be a little emptier without their incredible friendship.